testimonials - Nancy H. Holm, D.D.S. Dr. Holm, I was thinking of you today while I was at the dentist here in Texas. I was your patient for about 10 years or so, until we had to move to here for my work. Anyway, I've seen two other dentists down here since I moved away in March 2014. I just want you to know that these other two dentists - independently - upon inspecting my teeth, each commented regarding the quality of your work; Cerec, fillings, crowns. They were both impressed and stated so! Personally, I always appreciated your passion for your work - and my teeth/gums. I was proud to hear those laudatory comments from your peers, Dentists who don't even know you, knowing that I had received the best treatment from you in the past. That said, I just wanted to drop this note to you so you would have that feedback. Impressive office and staff. Both Lea and Dr. Holm are very professional and friendly – quick to make a new patient feel welcome and at ease. Top rated service from everyone I dealt with. For the first time in my life, I now look forward to going to the dentist. Always feel like I received 5-Star service from every employee. It’s truly rewarding to be treated as a VIP. As a declared "dentalphopbe" I can truthfully say that I have never experienced anything but kindness, patience, respect and the utmost care not to cause me any pain or discomfort at each and every appointment. Long time patient of Dr. Holm and will continue to be. Great group of people. We drive 200 miles one way to get our Dental services. Dr. Holm and the entire staff is a Godsend. We are so happy to have found the best dentist in town!!!! I am very comfortable with Dr. Holm and her staff. I absolutely love Katie, and she does a wonderful job with my cleanings! (very detailed, and gentle) Everyone at the office is easy to talk with and very friendly! The staff is always friendly and attentive. Dr. Holm takes the time to explain my care and follow up options. Best care and customer service is outstanding. I cannot believe I actually like going to the Dentist! I know I'm in good hands as a patient with Dr. Nancy Holm, DDS. I have learned a lot about my oral hygiene and what impact I can have on my own and what I can count on her and her staff to provide for me. Her office and treatment is current and up to date when it comes to my health, but the personal interaction with the entire staff while you are there is "old school", meaning you are treated with respect and kindness on a personal level that you just don't see many places anymore. I would highly recommend them. Everyone at Nancy Holm's dental practice really cares about my dental health and goes the extra mile to ensure I keep my teeth healthy to last for my entire life! Having neglected dental care for close to 20 years, through the hard work, and positive attitude, and clear goals I have reached a point of recurring maintenance appointments. They do NOT belittle you about the your bad habits of the past, rather about making your future better. Good folks! "I am a new patient. This is the first time I can truly say that I feel cared for - not just by Dr. Holm but by everyone in the practice. Thank you for everything!" 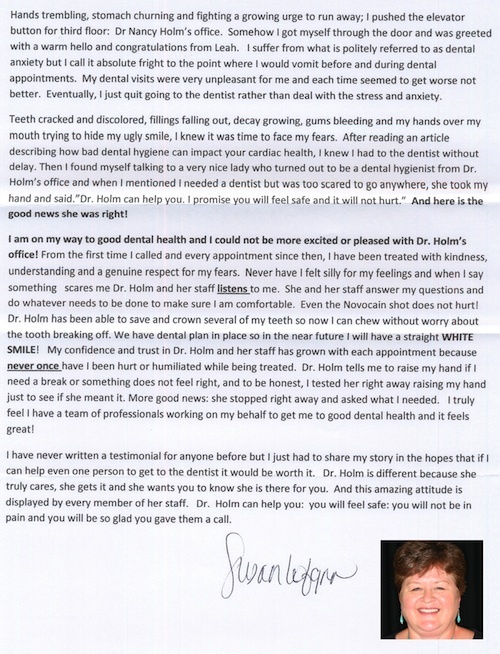 "Dr. Holm is the best dentist I have ever had. She is very professional and knowledgeable. For the first time in 50 years I know what is really happening with my teeth. I have always gone twice a year to my previous dentists but it was always very routine. Dr. Holm is very thorough and not only cleans and repairs my teeth but also has taught me what to do to keep them healthy. She cares for the well being her patients. Her customer service is the finest I have ever encountered. Thank you Dr. Holm for being there for me." 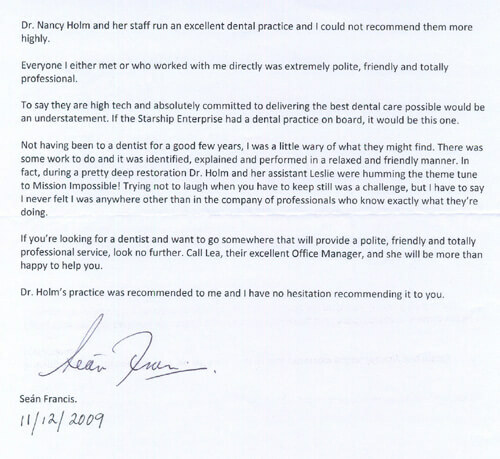 "I am very happy with my yesterday's appointment with Kat, my hygienist. She has great hands, and is caring and knowledgeable. And a good sense of humor, which is always a plus :-) Dr. Holm provides excellent care for her patients. She and her staff is always learning and keeping up with new research and technology. Whenever I come to see Dr. Holm or one of her staff, I feel cared for. I know I can trust her with my dental care. Leah and Teri are always the absolute champions of helpfulness. BIG thank you to all of you." 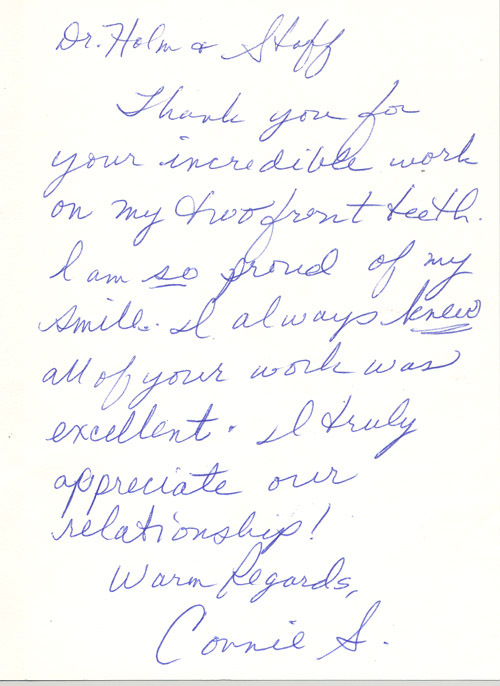 "Nancy Holms and her amazing staff have been caring for our families dental health for over 10 years. I recommend her to anyone who is looking for the best in dental care." "Another great dental experience. Always love seeing the friendly staff!" "I always enjoy coming to the dentist, especially to see my dental hygienist, Katie. She's always so happy and puts a (visibly cleaner) smile on my face." "You're the best, each and every one of you!" "Always such a friendly staff of professionals! This place is simply awesome! ALL of the people are very friendly & professional. I would rate it a 12 out of a scale from 1-10!" "My last appointment was very good as all my appointments have been. I always leave feeling more informed about my oral health and that it is going in a positive direction. And everyone here is so nice - it makes the visits very enjoyable." "Your office is top notch. Wouldn't go anywhere else. We opted out of dental insurance because your office wasn't covered on the plan." "In my personal opinion, Nancy Holm is probably one of the finest dentists in the state. It would be virtually impossible to receive better care than that which Dr. Holm provides. She is a caring, skilled professional who possesses a world of knowledge. Her dental support team is on the same elevated plateau of her practice. From the lovely receptionist to the skilled dental hygienists, they make a 'trip to the dentist's office' a somewhat pleasant experience." "Always a pleasure! The whole team makes going to the dentists an enjoyable experience. I enjoy knowing how and why they do the things they do and they are happy to share." "Everyone always goes out of their way to make me feel at ease." "As always, I experienced nothing but respect, interest, presence, kindness and expert care. Thank you so much." "Your are a great dental office. I will not change you guys for anything. Every time I come you are personal, you know what is going on with me, my family, you always make the effort to ask, and over everything, you HAVE NEVER made me feel guilty about my dental homecare." "Dr. Holm’s office is truly a place of ... I don't know the correct word ... but it is just the high road!" "Going to the dentist had never been a pleasant experience for me. I had been told by others that root-planing procedures took up to 4 visits, was painful and they couldn't eat for 3 days because of the pain and swelling. My experience at Dr. Holm's office was very different – one visit and I could eat immediately after the procedure. Dr. Nancy Holm and her staff have made going to the dentist a more pleasant experience. They are professional, very friendly and I highly recommend them." "Dr Holm has taken such good care of me! She made such a great effort to give me the very best of care. She is so thorough and does not leave any detail out. The entire team is friendly and has made me feel very comfortable. I have always been anxious about going to the dentist, but Dr Holm has worked with me and my anxiousness has all but left! I sing her praise over and over again and highly recommend Dr Holm." "I have been most impressed with Dr Holm and her entire staff! The attention to detail and individualized care (including follow-up) make going to the dentist more like going to a "tooth spa!" I am new to Minnesota but have already been giving out referrals to colleagues in need of a good dentist." No matter where we are- Florida or anywhere we will come back here. First time we came in 1999 it was awesome. Everyone is very pleasant and informative. "Everyone complimented me after and you could not even and can still not tell they are caps!" "All the years that I have gone to Dr. Holm's office, I have never felt guilt"
"How do I feel about going to the dentist? I cannot answer that question, but I can tell you how I feel about going to Dr. Holm's. I feel important, I feel appreciated, I feel understood, I feel listened to, and I feel like truly SMILING." "I get regular checks with my OB and my physician. The 3 of them missed a lump I had in my neck. It was Dr. Holm during her regular routine check the one who found it. She immediately contacted my doctors. None of them had a record of the lump... To make the story short I had to have the lump removed...if that does not impact somebody's life, I do not know what will impact it. I always felt guilt before going to the dentist, especially when I knew I was going to be told that I did not do a good job cleaning my teeth. All the years that I have gone to Dr. Holm's office, I have never felt guilt. If my teeth are not perfectly clean they explain to me how to do a better job but there is never that "blame" for not doing it right. Dr. Holm's team is amazing. There is always a smile when I arrive to the office, coffee!!! !, (of course), and the staff always ask about the family, how is my daughter doing in college, when is my mother coming to visit, how is work... they are always personal. One thing that speaks for itself about Dr. Holm's practice is the fact that her team is consistent. They have been there for the longest time. Is not like other places where you see a different person every other month. I am used to her team and I know who they are, how they work, and how they treat me. Dr. Holm is careful and through when she is doing her work. Whenever I go home after my appointment I know I do not have to go back because something is wrong. I am always happy, satisfied and feel good after seeing her. 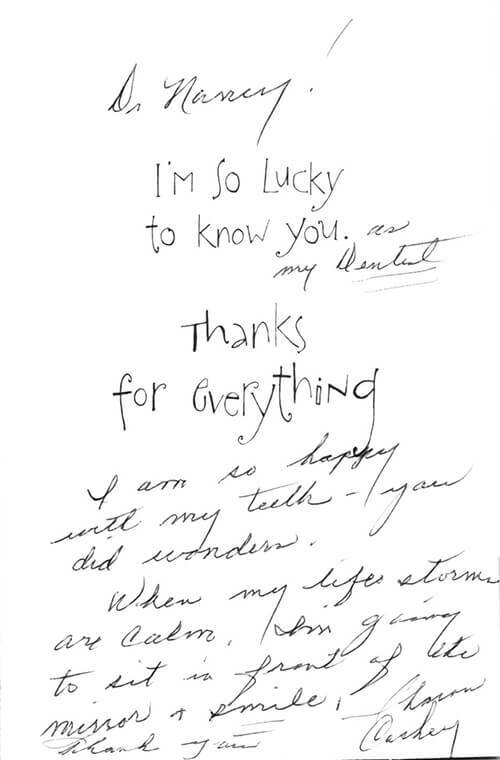 Not everybody can say that their dentists have impacted their life, but I can. About 5 years ago I had jaw surgery. After the surgery I had my regular follow up visits with the doctor. I also get my regular checks with my OB and my physician. The 3 of them missed a lump I had in my neck. It was Dr. Holm during her regular routine check the one who found it. She immediately contacted my doctors. None of them had a record of the lump. To make the story short I had to have the lump removed...if that does not impact somebody's life, I do not know what will impact it. How do I feel about going to the dentist? I cannot answer that question, but I can tell you how I feel about going to Dr. Holm's. I feel important, I feel appreciated, I feel understood, I feel listened to, and I feel like truly SMILING. "If I need any dental work, I'm coming back from New York to see Dr. Holm!" The best part was the before and after pictures. I wish I had done it sooner. I decided to give myself whiter teeth for my birthday. I was really apprehensive about using trays everyday for two hours. I thought it would be messy and uncomfortable, but it was a piece of cake. Not only that, but people started noticing about the 5th day. One friend even asked me if I was whitening my teeth. I am really thrilled with the results. The best part was the before and after pictures. I wish I had done it sooner. I have total confidence in Dr Holm and her staff to provide state-of –the-art, thorough and competent care. All staff has been friendly and sensitive to my needs. Dr Holm's approach is clearly to highly train and equip her staff to provide optimal care. What separates business today is the level of customer service they deliver. Excellence in a product or service is expected and high quality providers deliver at that level. Dr. Holm and her staff have raised the bar of excellence. They deliver a level of service that is not only personal and professional, but each team member of her staff works as a seamless team focused on "you" the patient. While in the office the experience is comfortable, friendly and you feel secure that the "team" is in control. That level of feeling cared for and personal attention creates loyalty and trust. From the moment you walk in the door, Lea greets you by name and offers coffee or other refreshments. The lobby is comfortable and within minutes you are taken into a private room where the procedures are done. The hygienist provides education and offers insights to enhance the care of your mouth and teeth. Dr Holm is amazing and her leadership and customer focus leads her staff. Lea is always multi-tasking, sets up future appointments and explains you bill. That is why Dr Holm and her staff have raised the bar of excellence in customer service and their patients are not only loyal and trusting but they will share their experience with others. "The beautiful bonding of my front teeth. I love my smile now! Thank you Nancy"
"When I met Dr Holm, I had I had (past) experiences ranging from, as a child-SCARY, to, as an adult, 'behind the times' and lacked in patient teaching. When Dr Holm opened her own office it was easy to see that she was careful in hiring quality people! People who were eager to share their knowledge to insure and promote good oral hygiene, and who cared about you as an individual. "Everything! The people the professionalism, the quality care knowing your mouth is in good hands. The beautiful bonding of my front teeth. I love my smile now! Thank you Nancy and thank you for telling me about MI paste. Now I have my coffee plus white teeth!" "They are the best! As people, as dental care professionals...I have no fear. I look forward to seeing friends, and know that I am in good hands. My teeth feel good and look good!" I am enjoying my new whiter teeth, my new white filling in my front tooth, and I am enjoying my new crown. The tooth with the crown never hurts anymore. I have never enjoyed going to the dentist. Your practice is spotless and you and your staff are very friendly. You did everything possible to put me at ease. I enjoy talking with you and your staff. I enjoy knowing in advance what I need to have fixed in the future. I like making a dental plan of what needs to be done. I like the feeling of no major surprises. I am still not a fan of going to the dentist, but I look forward to seeing you and your staff! It's a "friendly place, my girls love to go...they'd go monthly if I let them!" "Very caring and concerned about my dental health. I called Dr Holm with a dental emergency when I was out of town for a wedding in a rural community with no dentist. She walked me through what to do and even called me back later to check on me!" Before dentistry was "Something you just 'have' to do a couple of times a year... Felt just like a number in a file-not a personal relationship." "High tech office, with a personal relationship-feel like the staff knows me and my treatment-friendly staff, state of the art treatments, up to date on current trends like my dental implants and restoration." It's a "friendly place, my girls love to go...they'd go monthly if I let them!" They "keep me smiling." "I would recommend CEREC to anyone." "The appealing thing about the onlay was that Dr Holm did not have to remove healthy tooth as would be required with a crown. Also, it was complete in a single appointment, no need for a temporary crown and needing to return for the permanent fix. I would recommend to anyone that fits the profile for this treatment. " "Whenever I go to Dr. Holm's office and have treatment done, it is always painless. And, I've had a number of different procedures done. I always like coming in."